The Musik Planet is a music lessons studio in Riverside, California providing Piano, Guitar, Voice, Drum, Bass Guitar, Banjo, Ukulele, Violin, Cello, Viola, Saxophone, Clarinet, and Trumpet lessons. We are a founding school for The Royal Conservatory Music Development program, offering students opportunities on an international level. The Musik Planet is a music lessons and recording studio in Riverside, California. We have been in the same location since August of 2008. ...Click here to find out more about The Musik Planet Recording Studio... For over ten years we have provided qualified, seasoned instructors to the community – instructors that enjoy training and teaching music. With 10 dedicated teachers, we offer piano lessons, guitar lessons, drum lessons, voice lessons, group choir lessons, violin, viola and cello lessons, and flute, trumpet, clarinet and saxophone lessons. We also teach music theory, music composition, improvisation, beginner jazz, and bass guitar. Along with musical instruments, we teachPro-Tools, Sonar, and recording techniques. Our music studio specializes in private instruction with lessons tailored to individual needs and level of experience. We teach the beginner to the advanced, children to adult. Use the drop down list below to purchase lessons in single, one month, or three and six month increments. And if you are purchasing a gift certificate just let us know in the description and we will send you a nice certificate too! Please call us before purchasing so we can verify there is a time available for you first. Ready to really learn? Consistency pays off. Take a 1/2 hour per week for 12 consecutive sessions, just $349. Lessons are provided in 4, 12, 24 and 48 consecutive weeks. We don't roll over or extend lessons, but we do offer make up lessons or add extra time to scheduled lessons when time permits. Lesson Options at The Musik Planet - Save on 3 months or more. Is there a birthday coming up? Or do you just feel giving? Buy a gift certificate for someone special and give them the gift of music. * One-teacher to one-student lessons tailored to the student’s learning pace and needs. Sessions are available in 30 minute, 45 minute, and 1 hour durations. Call us for session rates. * There are no registration fees, and we do not auto bill and do not ask for a last month deposit. * Special lessons available for accomplished musicians who need to work on specific techniques. * These teachers teach for a living, not as a hobby. * Low pressure, optional performance and recitals are offered each month. *Weekly written lesson plans are kept so parents can see assignments. At The Musik Planet, we believe that regular showcases and performances are the key to success for the novice and the serious student. Those that want to enhance their studies will want to take advantage of performing in front of a non-threatening audience for experience. We encourage our instructors to perform and enhance their success as well. We encourage involvement with local music organizations so the students of teachers have opportunities to enroll in festivals, recitals, certificate of merit, local competitions, etc. These experiences give students experience and great resume reference for their future in any field they choose. Did you know that negative comments can actually reinforce wrong performance? In my experience with teaching piano, I have found that positive reinforcement is more effective than negative. In commenting to children and adults, I try to get them to see the desired results. This helps them to visualize and stir their creative juices with positive reinforcement. For example, "I like how you hit this passage, and counted this part. Let's carry that to this passage and phrasing." And, "Let me demonstrate for you. Watch how I count this. Now let's try it together." My philosophy is to help depict success and how to constructively change a weak performance to a strong musical one. University psychology studies have proven that pointing out wrongful and negative performance is not nearly as effective as bringing about desired change by giving positive comments. I remember hearing that the average child in the home receives only one positive response for every twenty-one negative responses. I heard this early on in my teaching career, but I always taught by positive reinforcement. I have continued to teach with positive reinforcement these past thirty years. Positive comments build confidence and the desire to do better. I choose to teach success, not stress. The Musik Planet is a proud Founding School and participant in the Royal Conservatory Music Development Program. 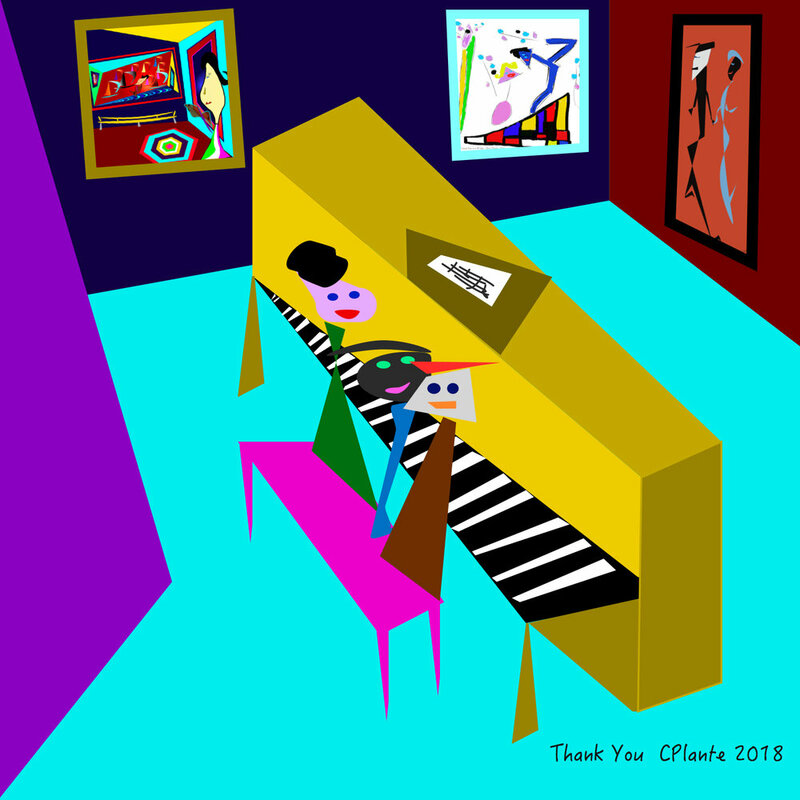 A very nice friend recently gifted our studio a piano, so Chris did this art piece for her as a thank you. It's called, "Thank You."